Alicia (mom of Ashton) is a savvy parent whose mantra for parenting her child is ‘always be learning’. What came first, the ‘chicken or the egg’ in Ashton’s curiosity, nature or nurture, I do not know? 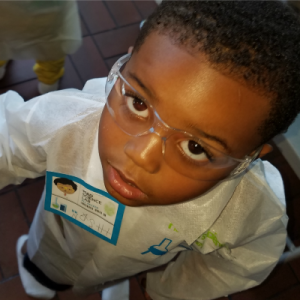 But when Ashton was about to turn 5 years old Alicia asked him what he wanted to do celebrate his birthday, he most assuredly declared…SCIENCE. He wanted to ‘do’ science and have a party. The daughter of a teacher, Alicia was not put off by the request. 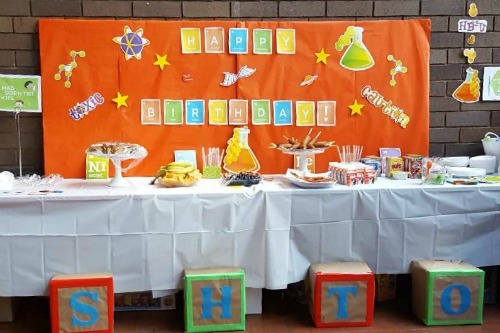 Instead, she was spurred into action to create a science birthday party that Ashton would love. So what did she do? First, she invited 26 of his friends. Then she rented a room at the local Recreation Center. It had a designated Party room complete with an indoor playground. Next, Alicia consulted the online publication Chicago Parent. The preschool parenting section and discovered tons of exciting experiments suitable for a children’s science birthday party. In the preceding weeks, her motto became ‘science in everything, ‘science is everything’. She selected six experiments she hoped the children would find educational and, of course, fun. Then set about ordering and buying the necessary components the children would need to be involved. She ordered children’s disposable lab coats and goggles from us (Yay!). She wanted to make a real impact with the decoration and also to get children into the science theme. So she visited the Etsy website and printed science ‘Access Only’ signs. ID badges and posters. Alicia had so much planned for the party that she decided to host breakfast AND brunch. Quite the undertaking! She bought food for that. Making sure it was easy, buffet, party food. She enlisted friends to help her make science ‘atom’ centerpieces for each table top. When the day came, she and Ashton were so excited. 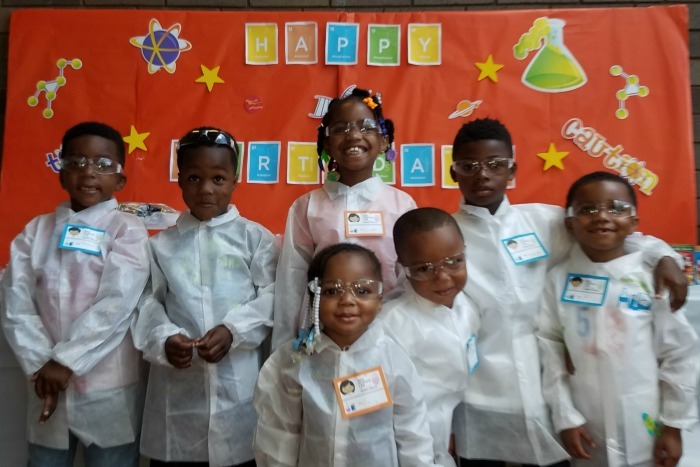 Each child was given their own science lab coat to decorate. They filled out their ID badge, and, finally, put on their goggles. When they were dressed in their laboratory garb, she took a photo. They went off for breakfast. When Alicia announced they had to go and put on their lab coats the kids were running over each other to get to the coats and put them on. They said they felt ‘official’. Now it was time for the mini scientists to go to the ‘lab’. Alicia set up a lab of science experiments for the children. They started with a reenactment of a tornado with crafty use of a kids playground tunnel and 6 hair dryers. What?! Alicia placed 2 children in the center of the tunnel at a time and readied 3 hair dryers (on the cool setting) at each end and on a count of three. They turned them on and blasted the occupants with turbid air. This was a big hit! Here is a list of the other science birthday party experiments. Erupting Volcano – for this Alicia’s sister made a 2 sided volcano. One side had wildlife painted on it and the other side had dinosaurs. They made ooey, gooey Slime – Gak. Make Snow – For this Alicia froze baking soda and hair conditioner. On the day she added a touch of glitter and mixed up the concoction. To be amazement of the children (and Alicia) it made snow! She said it actually felt like snow. The kids loved this and the Tornado (see below) the most. Archery – This was fun and team building. One pulled back the arrow. The other aimed at where they thought it would hit the bullseye. Alicia said the room was full of happy children. Ashton loved his birthday. Next year? How will she top that? Well, Ashton received a paleontologist kit for his birthday which he is super excited about so maybe a dinosaur dig. That woman is creative! I think I want to go! !